Our family is crazy about bananas. Our fruit bowl is usually overflowing with them! We eat them as a snack, in pancakes, in sandwiches, in cereal, put them in our smoothies, use them to make nice cream…you get the picture. We buy several bunches of bananas each time we go to the grocery store, but I’m really particular about my bananas. I will dig through the boxes under the banana table looking for the greenest bunch of bananas that can be found. I know, I’m a crazy woman! But you see, I just can’t eat bananas past the point of greenish-yellow. Maaaaybe if it has turned yellow with streaks of green, but it CANNOT have any spots on it whatsoever! No, once they’ve gained spots they’re shunned by the kids and I, aka the banana snobs, and no longer suitable for regular consumption. They’re automatically “reduced” to cooking, baking, slash smoothie making bananas, which is totally fine by me! I hope you’re able to give these a try! If you do, please let me know how you like them in the comments below..I always appreciate your feedback! 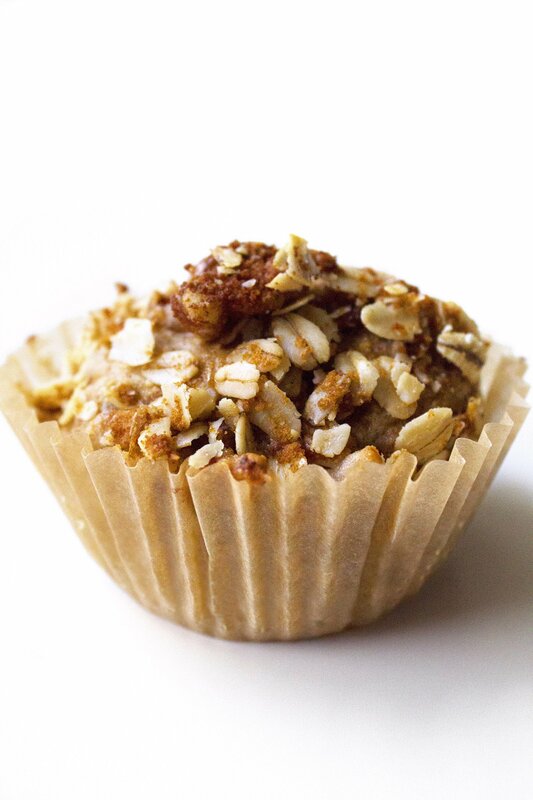 Lightly sweetened, wholesome banana muffins made with oats. Perfect for breakfast on the go or a quick and healthy snack! *You can easily make your own oat flour by grinding rolled oats in a food processor or coffee grinder. Try to grind it as finely as possible until you get a flour-like consistency. Measure out 1.5 cups of the ground flour. Preheat oven to 375F. Grease or line a muffin tin with paper liners. 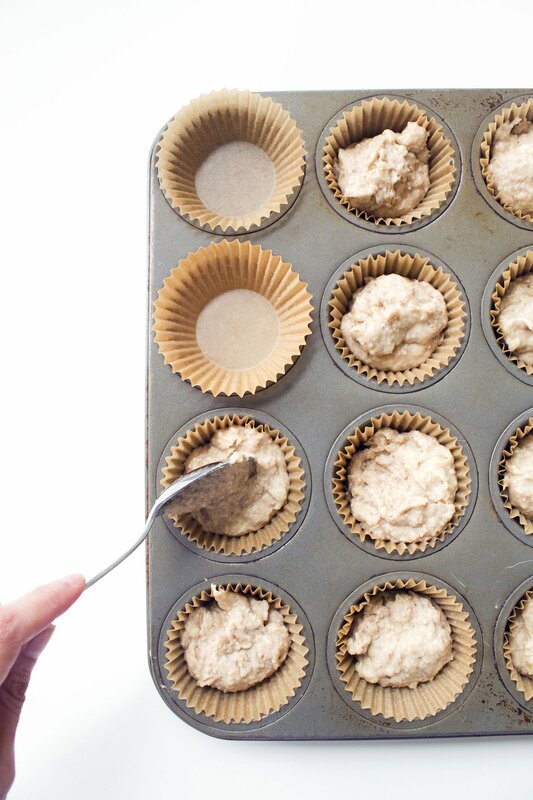 In a large bowl mix together oat flour, oats, flaxseed meal, baking powder, baking soda, salt, and cinnamon. Add banana, eggs, sugar, oil, and milk. Let sit for a few minutes while you make the streusel topping so the oats can soften. 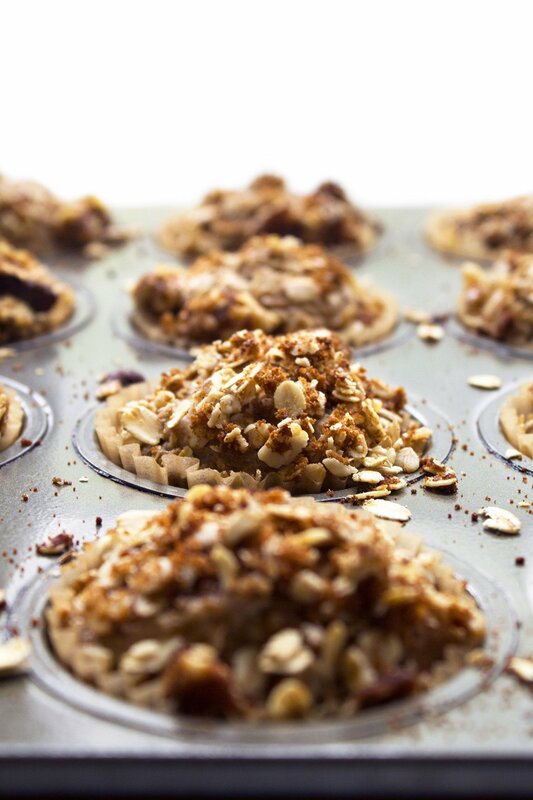 To make the streusel, combine oats, nuts, sugar, and cinnamon. Mix in the coconut oil until evenly incorporated. Fill each muffin cup two thirds full. Should make 12-14 regular sized muffins. 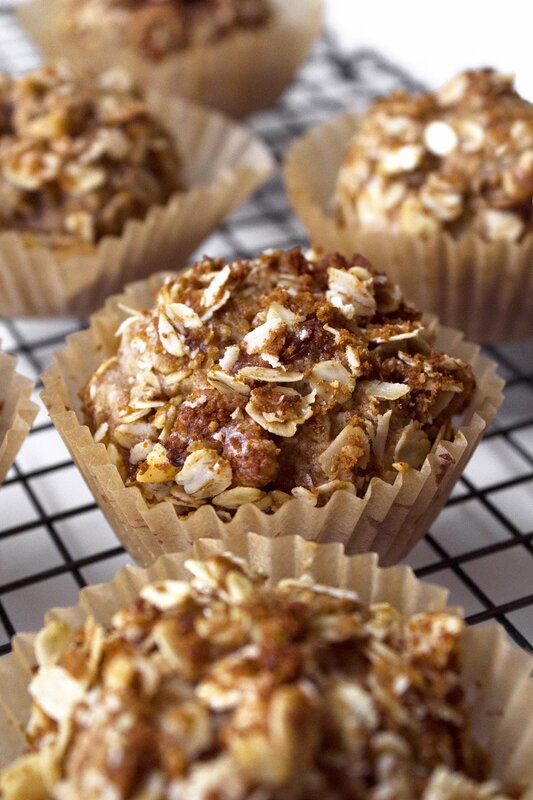 Top the batter with a sprinkle of oat streusel. Bake in the preheated oven for 15-20 minutes (depending on your oven) or until muffins are golden brown and tops are firm. Coconut sugar causes baked goods to become slightly browner than regular sugar will. Don't be alarmed at the darker color of inside/outside of the muffins. I made these and they tasted great but were so crumbly they have to be eaten with a spoon. They can’t be removed from the muffin holders without falling apart. Wondering if I just didn’t cook them long enough but they taste cooked. Did you buy oat flour or make it yourself? Did you let the batter rest for a few minutes? If I could guess, I’d say it could be either the oat flour not being ground finely enough or the batter may just need to sit a little longer so the oats can absorb the liquid. The batter should be wet and get a little gummy as the oats and flax seed meal soak up the milk. Please let me know if you get a chance to try the recipe again with these modifications! Thank you for your input. I’m happy you were able to enjoy the taste of these even though they were crumbly 🙂 I hope they turn out perfectly for you next time! These muffins look absolutely delicious and easy to make too. I think I’m going to make them for a ladies breakfast coming up, I bet they’ll be a big hit! Thanks for the great recipes! I woke up today with over two dozens of bananas from our neighbor in my kitchen counter. Definitely going to take advantage of this recipe! Great! these muffin are very beautiful, excellent. I’m definitely going to have to make these as we move into baking weather! I know, I’m looking forward to baking season! Thanks, Rae! Hope you enjoy them! I know right! I am same, I can’t eat bananas once they have spots on them but those are actually the best for baking so yay for over-ripe bananas! These muffins look fantastic! These muffins look so scrumptious! And they’re healthy, too – bonus! WOWZERS these look amazing!! I love how you’ve totally made a decadent morning treat healthy! And I MUST know what kind of lens you use to take your photos – they are absolutely gorgeous! Seriously?! WOW I’m crazy impressed! Thanks Joscelyn! Oh I love the look and sound of these. Innocent enough to eat for breakfast without feeling guilty about it and yummy enough to feel like they are proper treats. Thumbs up! These look really delicious! Bonus points for being really healthy! Liz, great idea! Joscelyn, thanks for another great post. I am looking forward to making these in the near future!